Mmm-moussaka! 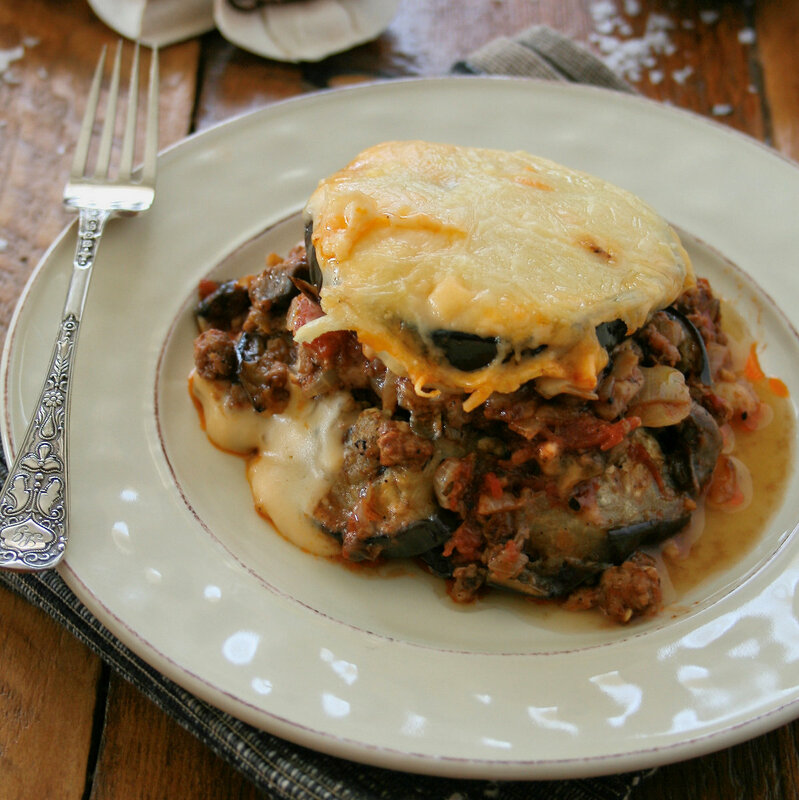 Mushrooms, mince and melty cheese, what’s not to love? Even the most staunch anti-auberginers (those poor berated brinjals) will be tempted by this dish. 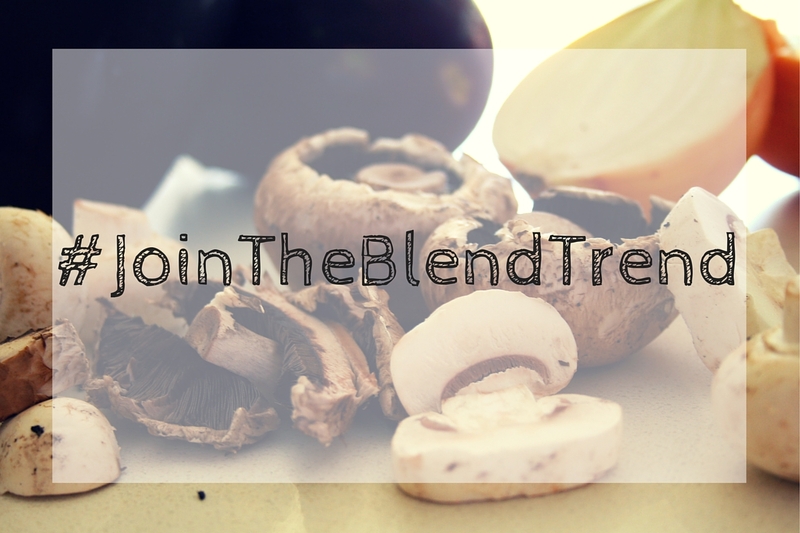 This is my latest recipe in the #JoinTheBlendTrend series, and the amazing thing about it is that you would never guess that the filling is 50% mince and 50% mushrooms. 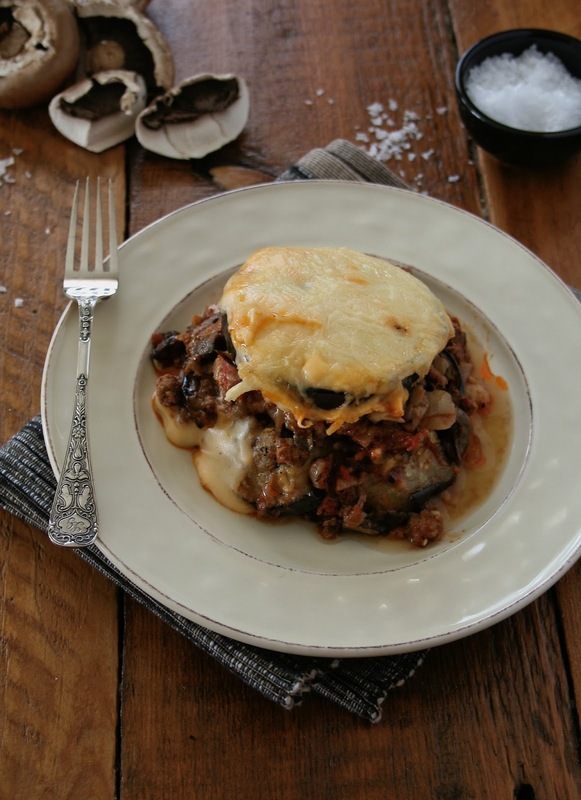 Thanks to their flavour and texture the mushrooms blend perfectly with the mince, lowering the calorie content of the dish while stretching it into more portions and giving it a fantastic flavour. 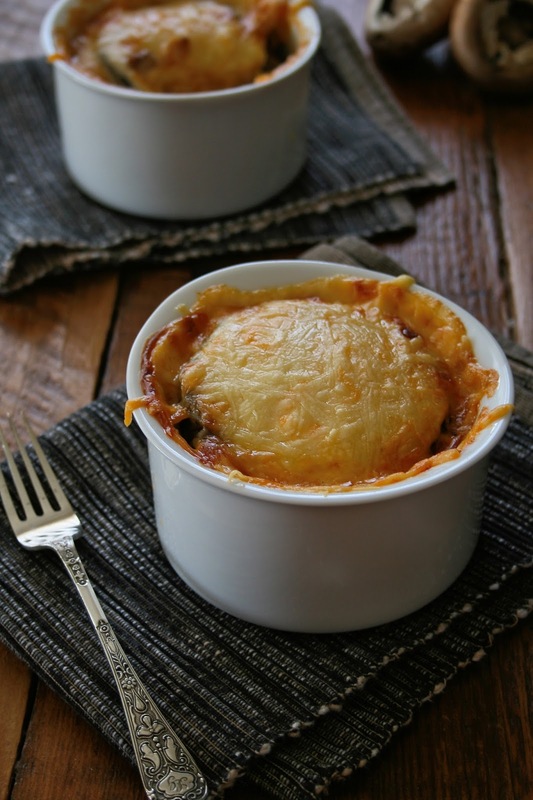 This moussaka is very delicately flavoured with cinnamon and nutmeg and I would gladly tuck into a bowl of it any day! October is Breast Cancer Awareness Month, a subject that is close to many of our hearts, and you may have noticed that your mushroom punnets are looking a little different this month! Pink punnets are filling the shelves to help create awareness of the potential role that mushrooms play in fighting breast cancer (more about that below) and to raise funds for silicone breast prostheses for disadvantaged women who can’t afford them or reconstructive surgery. I was amazed when I recently found out that studies conducted at the Beckman Institute at City of Hope Cancer Centre, California with the University of Australia, Sydney in collaboration with Zhejiang University, China have found that women who eat on average 10 grams of mushrooms daily seem to halve their risk of breast cancer! In this blog series I have highlighted many of the reasons why adding mushrooms to your meals is beneficial, but this one is a biggie. 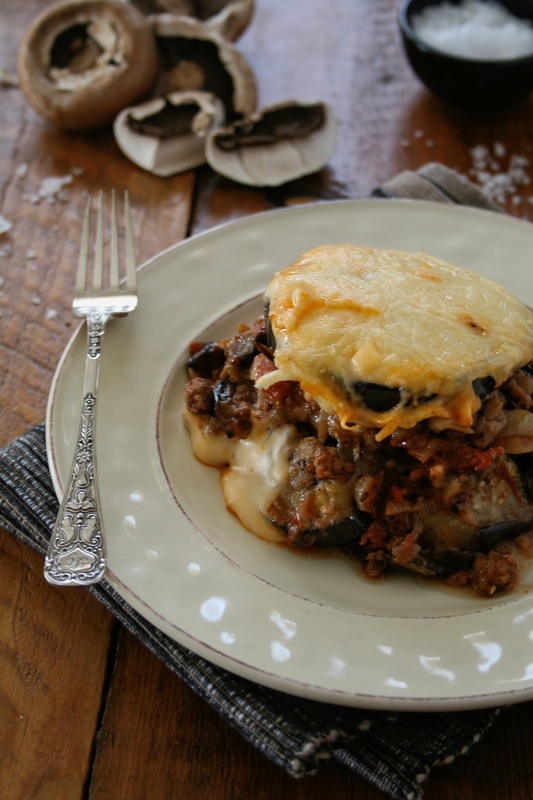 So hug an aubergine, get your gorgeous paws on some mushrooms and make some delicious moussaka for your nearest and dearest this week! Lovely readers, you can support SAMFA’s The Power of Pink promotion this month by stocking up on pink mushroom punnets. Not only will you be making a healthy food choice but also supporting those affected by this devastating disease. Pink mushroom punnets are available at Pick ‘n Pay. R1 from the sale of each 250g punnet will be donated to Reach For Recovery. I like to use a combination of brown and white mushrooms in this recipe, but feel free to use your favourite variety! You can also top the dish with grated cheddar cheese instead of parmesan if you prefer. This dish works equally well whether made in a large ovenproof dish or individual ramekins. If you decided to make individual portions simply use four 300ml ramekins and reduce the baking time to 30 minutes. 1.) Heat the olive oil in a deep saucepan. Sauté the onion and garlic for 5 minutes or until soft. Add the mince to the pan and brown. 2.) Add the mushrooms, cinnamon, oregano and nutmeg to the pot and cook for 2 minutes. Pour in the wine and season with salt and pepper. Allow to simmer until most of the liquid has reduced. 3.) Add the tin of tomatoes, stir well and leave to simmer for 15 minutes. Check the seasoning. 4.) Cut the aubergines into 1cm slices. Drizzle the slices with olive oil and season with salt and pepper on both sides. Heat a frying pan, then fry the aubergine slices for 3-4 minutes per side until golden. (It is easiest to do this in batches.) Set aside. 5.) Prepare the cheese sauce by melting the butter in a small saucepan. Remove from the heat, then whisk in the flour. Return the pot to the heat and cook for a minute before gradually adding the milk, whisking continuously. Continue to whisk until the sauce has thickened. Remove from the heat, then whisk in the cheddar cheese until smooth. 6.) To assemble: Preheat your oven to 180ºC. Remove the cinnamon stick from mushroom filling at this point. Layer the aubergines and mushroom filling in a large ovenproof dish – I like to start with a layer of aubergines at the bottom, followed by half of the mushroom filling, then another aubergine layer followed by the other half of the mushroom filling, and finally another aubergine layer on top. 7.) Pour the cheese sauce over the top. Sprinkle with parmesan cheese and pop in the oven for 45 minutes. Allow to stand for a few minutes before serving. Disclosure: This post is sponsored by MushroomsSA. Recipe and images are my own and were created for the #JoinTheBlendTrend campaign. Looks delish! I have a question…if I substituted lentils for the meat, would I use the same amount? Looks divine! Lovely to “meet” you Teresa! You too, Alet. Thanks for stopping by! The moussaka is looking delicious, Teresa! I love mushrooms! I noticed that your blog is featured at the USRG site. I was wondering what is your experience with them? They approached me as well asking me to allow them to feature my posts but I am not familiar with their site, it seems to be mostly a restaurant review site. Thank you for sharing your thoughts. Hi Marilena, funnily enough you are the second blogger to ask me that this week. I have only been with them a short while and have to be very honest, have not had any traffic from them. I guess it doesn't hurt to share your content on a different platform, you just need to decide whether the effort required is worth the reward. In my case – not so much. Good luck! I love moussaka!!! Is the cheese sauce similar or the same as a Bechamel? Thanks Kelly! The sauce is essentially a bechamel sauce (white sauce) to which I’ve added the cheeses. 😉 Enjoy the recipe!